Even though your marriage ends when the judge approves your divorce decree, it doesn't necessarily follow that your divorce case itself is finished. You may have a variety of outstanding issues remaining to be resolved before you can count the family court system completely out of your life. Additionally, you may find yourself grappling with motions to modify prior court decisions on child custody, child support or spousal support. Responding to your former spouse's post-divorce motions requires an understanding of your state's unique family law and civil procedure codes. Review the motion and any corresponding affidavits or certifications to determine exactly what your former spouse is asking the court to do and what facts underlie her assertions. Depending upon your state -- and the opposing attorney -- the motion may be very fact-specific or bare-bones minimum. Review the documents with which you were served and compare the allegations against what you know to be true. Review your state's civil procedure code to see if your ex-spouse's filing is one that requires a written response. Unlike an original petition or complaint, motions don't always require written responses in every jurisdiction. If a written response is allowed or required, there will usually be a deadline for filing one. These deadlines will vary by state law. Determine what form your written response must be in if you're required to file one. In most states, you have the option of filing your own affidavit or certification. Depending upon the circumstances, you may want to file a "cross-motion"-- a motion of your own that centers around the same basic set of circumstances. When one parent files a motion for contempt for failing to pay child support, for example, the other parent may file a motion asking the court to deny the first motion presented and reduce child support. In a cross-motion, you're asking the court to grant you your own relief being sought, not simply deny the other party's request. Put your written response or cross-motion in the correct format for your state and locality. At a minimum, your first page needs to contain the case caption -- the names of the parties, state, county and court where the action is pending, and the case number. You can review the public access files at your local courthouse to see how others have styled their responses to similar motions. Sign and date your motion before filing with the clerk and serving it on your ex-spouse -- or, if she's represented by an attorney, serving it on the attorney. Although civil procedure varies from state to state, all filings by unrepresented parties generally have to bear that party's signature. 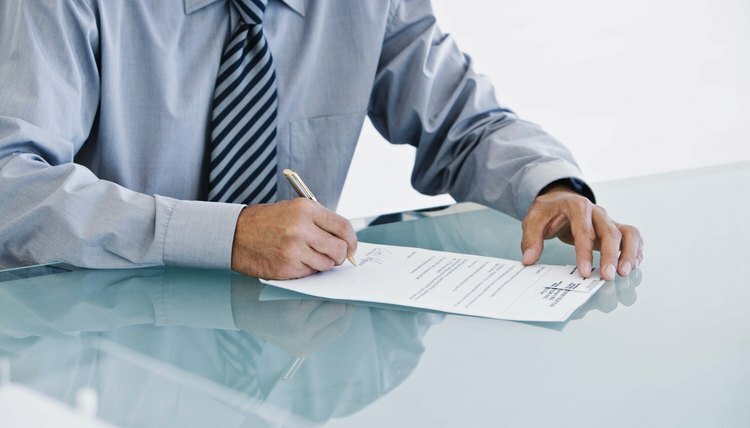 Your signature constitutes your certification that everything you have written is true and that you're not making the filing for an improper purpose. A motion for a divorce hearing is usually asking for an order granting one of the parties temporary relief while the spouses are hashing out the ultimate terms of the divorce. Usually such motions in divorce cases are filed with the initial petition for divorce or shortly thereafter so that child care and financial obligations are met for the duration of the divorce case.